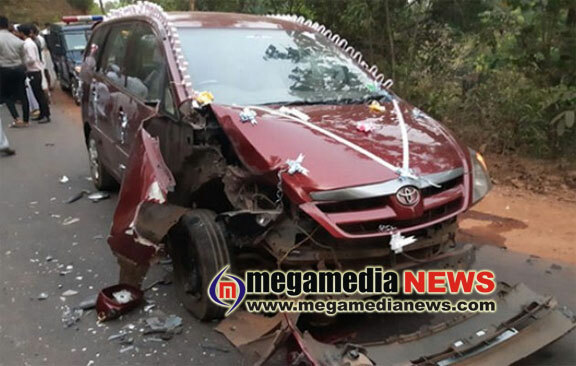 Mangalore : Three persons, including a child, sustained injuries while a newlywed couple escaped unhurt after a lorry collided into their car at Kemraje near Kanyana on February 11, Monday. The mishap took place when the wedding party, including the bride and the groom, were on their way to Paivalike after the wedding ceremony at Maratimoole in Kanyana. The front portion of the car was damaged owing to the impact of the collision. Locals who gathered at the spot expressed angst that lorries carrying jelly stone powder which frequent the area were responsible for such mishaps.